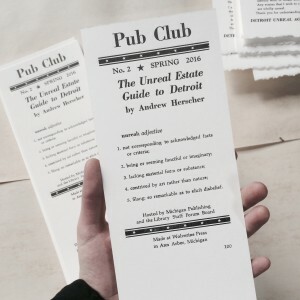 The Michigan Library Publishing Club (Pub Club) will be hosting its second free, open event, featuring a conversation about The Unreal Estate Guide to Detroit with author Andrew Herscher, on Thursday, May 12, 2016, 3:30-5:00pm, at the University of Michigan’s Hatcher Graduate Library Gallery (first floor, Room 100) in Ann Arbor. 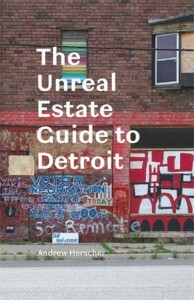 Published by the University of Michigan Press as part of the digitalculturebooks imprint, The Unreal Estate Guide to Detroit can be read online for free and is also available to purchase. There is no reading requirement to participate in the Pub Club, but we hope everyone can check out the book’s introduction to follow along in the discussion. Please join us May 12 for guaranteed good conversation, plus free coffee, treats, and collectible letterpress bookmarks, handmade by author Andrew Herscher and Michigan Publishing staff at Wolverine Press. All community members are encouraged to attend this free, open event. Add yourself to the Michigan Library Publishing Club group on Facebook and RSVP to the event for more details. We look forward to seeing you there! Michigan Publishing has implemented the exciting digital annotation tool Hypothes.is for readers to share their thoughts about our open access publications and engage with other readers online. We’ll discuss select annotations at the event from readers who comment with #pubclub—so dive in and start commenting! The Guide documents art and curatorial practices, community and guerilla gardens, urban farming and forestry, cultural platforms, living archives, evangelical missions, temporary public spaces, intentional communities, furtive monuments, outsider architecture, and other work made possible by the ready availability of urban space in Detroit. The Guide poses these spaces as “unreal estate”: urban territory that has slipped through the free-market economy and entered other regimes of value, other contexts of meaning, and other systems of use. The appropriation of this territory in Detroit, the Guide suggests, offers new perspectives on what a city is and can be, especially in a time of urban crisis. Andrew Herscher is Associate Professor of Architecture at the University of Michigan. He also co-founded the Detroit Unreal Estate Agency, an open access platform for research on urban crisis using Detroit as a focal point, and is currently a member of the We the People of Detroit Community Research Collective. Open to the public, the Pub Club meets quarterly (our inaugural event in February was a great success!) to discuss open access books, journals, and digital projects published by Michigan Publishing and is committed to supporting innovative ways for readers and authors to engage with open access content and to providing a welcoming space where diverse conversations can thrive.